My Funny, Funny Family: Pregnancy Update: 37 Weeks, Don't Midwives Even Like Va-jay-jays? 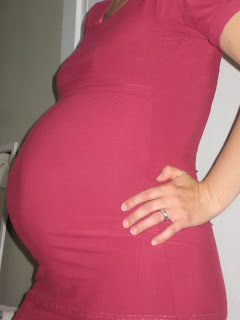 Pregnancy Update: 37 Weeks, Don't Midwives Even Like Va-jay-jays? Check out that belly -- it's actually big! Just today two different people assessed my state of advanced pregnancy accurately. A mom at the park asked, "Not much longer?" and a dude behind me at the grocery store looked me over and asked, "8 months?" Sir, you should work at the carnival! I almost asked him to guess my weight, too, which according to the midwife is 170.5, up 1/2 pound from my visit 2 weeks ago. I'm actually feeling better than I did when I last wrote about pregnancy, mainly because Toth has indeed dropped and stopped the torturous expansion of my rib cage. Nowadays, I still wake up a million times a night to pee -- that actually got worse when he dropped into my pelvis, as you might imagine. And I still feel achy when I wake up all those times, but the aching is just in my hips. I don't know about you, but the ribcage is just a tender area that should not be abused. The hips, well, mine at least, are built to take some. So far nothing feels labor-ish, which is very good, because I have a mild cold and still have a long to-do list (more on that below). I do have a baby's head pressing down on my cervix, as the midwife confirmed Monday by palpating, so I wouldn't be suprised if a certain M.P. makes an appearance or something. (If you are grossed out by anatomical pregnancy details, do NOT follow that link. I warned you.) But the midwife confirmed my feeling that in anything but a first pregnancy, the baby dropping does not necessarily mean labor is imminent. In fact, she said, if I were to go swimming or something, the baby might even float back up again a bit. Well, that's incentive to NOT tackle that to-do list item that involves a trial membership at the local gym. I like the baby where he's at, thankyouverymuch. Besides, the midwife also agreed with my suspicion, after two posterior babies, that the recommended swimming, leaning-forward sitting position, etc., probably won't do much to make Toth lie the right way. It's probably just the way I'm built that seems to encourage my babies to come out sunny-side up. I kind of wonder, though, if these women even LIKE vaginas? Because if not, maybe you are in the wrong line of work, ladies. I was all ready to drop trou, and the nurse was like, take your OWN Group B Strep culture. In eight months of visiting these women, I've only had my pants off once. Find camera. Done! It had fallen behind my bedside table. Schedule appointment with back-up OB. Done. Get some blogging work done. Done. But still more to do. Pack hospital bag. I did most of it tonight while putting away laundry. Or maybe about 1/2 of it. But anyway, it's started, and how much do you really need to bring anyway? Non-birth related tasks: Got wedding present and dress to wear at wedding (I even found something that will work if I'm pregnant or if I've already had the baby. Thanks, Majamas! ), ordered one Father's Day present, have an easy-to-execute plan for other. Gee, it felt like I had checked off A LOT more items when I was doing this stuff. Looking back at my list, there are still 1 million items not crossed out. Oh well, tomorrow is another day. look at that belly! i love it!! i had some SERIOUS negative thoughts at the end of my last pregnancy, too. hope the hypnosis works for you. if we decide to have another one, i might give it a shot. LOVE that dress! Cute belly, Carrie! You always look so darn cute pregnant! Great photo! And good job on the to do list! Where did you get that cute maternity dress? Am 34 weeks pregnant and would love something cute to wear. Not that I'm feeling cute. no no no. Thanks, all! Sprinkles -- the dress is from Majamas, a designer in Oak Park, IL that is supposed to be for postpartum but works for maternity too (it's pretty much stretched to its limit, though!). This is one of 2 dresses I ended up buying for our upcoming family wedding, because they were both samples and were selling pretty cheap. I think you can find Majamas in some maternity stores; check www.majamas.com. Lookin' good, honey! I can't believe it's almost time. Congrats to you and your family. If your registering for your baby registry there are some great offers out there right now that will save you tons of money!